Andrew Luck was largely the same player in September and October, but has really popped in November. Robert Griffin III got off to a flashy start, but has started sliding back. 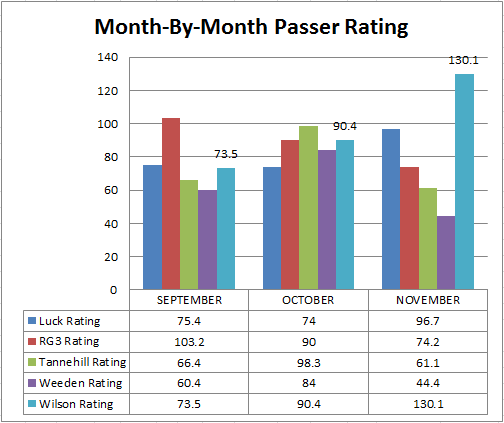 Ryan Tannehill had a great October, but has been largely ineffective the rest of the year. Brandon Weeden had a solid October, but has been poor other than that. Russell Wilson has made steady, and significant, steps forward in each month. He has done this while facing the toughest competition of the five rookies. The RG3 numbers deserve an asterisk as he has only played one game in November. Still, there is some evidence that NFL defenses are catching up to his style of play. Luck and Wilson are showing signs of catching up to the defenses they are facing, and in some cases, dominating them. Wilson is about to go on the road, where he has not performed as well, for two games against tough defenses. We will check back to see if his progress is sustained after those match-ups. Regardless, his progress to this point is eye-opening. I live in Washington DC and even though the locals are madly in love with him, they're already starting to worry that NFL defenses are figuring out RG3. The Skins have some of the dumbest fans imaginable, but on this one,I think they are spot on. Love these write ups, keep'em coming!